Available in both standard and limited editions. 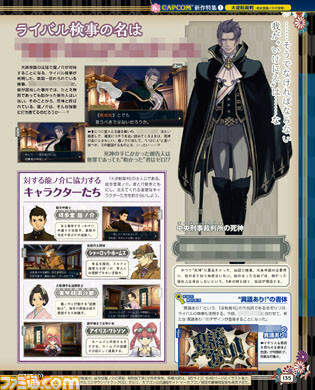 The Great Ace Attorney will launch for 3DS on July 9 in Japan, the latest issue of Famitsu reveals. The standard edition will cost 5,800 yen, while a limited edition will run 7,300 yen. If you missed our previous coverage, the game stars Ryuunosuke Naruhodou, an ancestor of Phoenix Wright, alongside Sherlock Holmes and Watson, and will see players battling in the courts of Meiji era Japan, as well as British Empire London. Famitsu this week also has a look at Ryuunosuke’s rival, as well as details about the courtroom battles that will occur in the British Empire. Further details have not yet leaked.